It gives me great pleasure to cite Mark Chandler for the Excellence in Earth and Space Science Education Award. Mark’s dedication to ensuring that students have the tools to effectively learn about the Earth system can be seen in the development history of the Educational Global Climate Model (EdGCM). 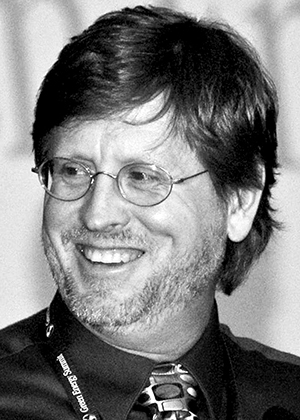 Mark’s inspiration for creating EdGCM came from working at NASA Goddard Institute for Space Studies with summer institute students who wanted to run climate model experiments themselves, despite not always having access to NASA’s programmers and supercomputers. Mark wanted something that would give students hands-on experience with a global climate model and also teach them the steps of the scientific process that climate modelers follow in conducting their research. Moreover, he believed that this would help demystify the role of modeling in climate science at a time when skepticism of complex models was growing, something that has important ramifications for a public needing to make and understand policy decisions aimed at mitigating climate change. Mark began work on the project with some talented high school students in the mid-1990s but received initial funding in 2003, when the National Science Foundation’s Paleoclimate Program saw the potential impact of the idea. NASA’s High-Performance Computing Program followed, and EdGCM was released publicly in January 2005. To keep EdGCM sustainable, the project partially transitioned to a license-based distribution system, a necessity when NASA’s Global Climate Change Education Program funded nine projects that all planned to use EdGCM. While enthusiasm for EdGCM grew, feedback from high school teachers indicated that it remained too difficult to manage, especially given classroom time constraints and the proliferation of tablets and Chromebooks. Mark responded with a browser-based tool called EzGCM for the K–12 community, which is now in use by the American Museum of Natural History and is being piloted in Lincoln, Neb., public schools, together with a curriculum developed with the University of Nebraska. There have been >40,000 downloads of EdGCM and so far over 3,000 users of EzGCM. The software has seen use on seven continents and at nearly 200 institutions, covering subjects that include atmospheric science, climate change and impacts, environmental science, engineering, geography, and physics. Mark has personally given over 100 presentations and workshops since 2000. For his unwavering dedication to the development and support of EdGCM and its effective use in teaching secondary and postsecondary students, Mark Chandler clearly deserves the AGU Excellence in Earth and Space Science Education Award. —Tamara Shapiro Ledley, Independent STEM Education Consultant, Earth and Climate Scientist, Needham, Mass. I am honored to receive the 2018 Excellence in Earth and Space Science Education Award. It gives me special satisfaction to accept the award for the team of the Educational Global Climate Model (EdGCM) project. There are few scientific endeavors that take a more sustained team effort than developing a GCM, and the fact that EdGCM exists at all is a testament to the talented scientists and programmers at NASA Goddard Institute for Space Studies. They have had open doors and given invaluable advice, and I’m immensely grateful. My other team, who spent 7 years developing EdGCM, consisted almost exclusively of high schoolers and undergraduates who were hardworking, creative, excited just to be at NASA, and like most youth, adept at doing things others said shouldn’t be done. While part of me is amazed that EdGCM even exists and is used by so many, I think my students knew then that teachers needed such tools to engage and convince their own emerging skeptical generation. In 2018, when skepticism seems to be rising faster than atmospheric CO2 levels, the need for educational support of authentic classroom research has become an imperative. And if climate scientists will create great modeling tools that not just work for researchers but also allow students to participate in the process, I’m certain we won’t spend so much time trying to convince people of the efficacy or urgency of our findings. In 1996, climate scientist David Randall wrote, “GCMs will begin running on workstations in high schools, and possibly elementary schools. They may even be running in the offices of congressmen.” I believed him then (he’s an AGU Fellow, after all), but I just didn’t realize I’d still be trying to make it happen 22 years later. I wish we’d made more progress, but the next 22 years look promising. I thank NASA and the National Science Foundation for supporting EdGCM, the concept behind it, and the people who use it. I thank my dedicated team (all two of them) who work hard to support EdGCM’s users. Finally, I thank all educators who take on the role of teaching climate science and using climate models despite the obstacles placed by administrators, politicians, budget cuts, and bugs in EdGCM. I hope that together we will provide even better learning experiences under the Next Generation Science Standards and give next-generation science students the tools and opportunities they deserve to solve the problems we have bequeathed to them. Citation: AGU (2019), Chandler receives 2018 Excellence in Earth and Space Science Education Award, Eos, 100, https://doi.org/10.1029/2019EO113787. Published on 16 January 2019.